When the imminent publication of this new book was first brought to my attention a plan was put in place to write a review for the London Historians blog based on my interest in the Port of London. I eagerly awaited its delivery from the publisher while early ideas for the review were developed in my imagination. Within minutes of its arrival all plans had changed. The book was not as we expected! If you are presuming this book to be an in-depth tome on the Port of London as it reached the post-war trading peak prior to a relatively swift demise, you will be sadly disappointed. So, let me say from the outset, it should rightly be entitled ‘Merchant ships of the London Docks of the 1960s’. Nevertheless, if your interest is in international 20th century merchant shipping, this is a book for you. 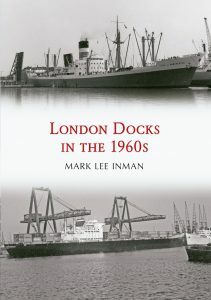 The author of London Docks of the 1960s, Mark Lee Inman, was a student at Queen Mary’s College in the second half of the 1960s. It was a time when the port, from Tilbury up to the Pool of London, was still thriving, prior to the introduction of containerization and roll-on/roll-off ferries. The decline of the upper port in the 1970s and ‘80s is well-known. Yet, around the time Inman arrived in London, a thousand ships were arriving and leaving every week, importing and exporting goods from every part of the world. In 1960 three quarters of a billion pounds worth of cargo passed through the docks and wharves. An all-time record in tonnage was achieved during the years between 1962 to 1964. When a gang of stevedores and ordinary dockers were required to load and unload a ship, well over twenty thousand workers still had employment in the port. Wild-strikes by militant dockers aside, it seemed inconceivable then that twenty years later miles of riverside would become a redundant wasteland. His interest is clearly in shipping so, with Port of London Authority permit in hand, Inman spent his weekends wandering the docks, photographing the vessels he witnessed there. Now, over fifty years later, they serve as a historical record, presented in this slim volume. The book is divided according to photos taken in the Pool of London and various docks, including the West India, Surrey Commercial and Tilbury, but the majority are in the Royal Docks. Presumably any vessels in the St Katharine, London or Millwall Docks were by the ‘60s too insignificant to be photographed or to warrant inclusion. I am no expert on the subject of merchant ships and, to be honest, the details of their design are rather lost on me. What they have in common are numerous derrick cranes for lifting cargo, as well as large holds. Some in this collection dated back as far as 1929, managing to survive through the war. A few, such as American-built Liberty ships, were constructed during the war years. Others were brand new, made bigger and faster than those of previous decades, yet quickly to become outdated. What I did find quite fascinating was the brief history given by Inman of each vessel, including the provenance and where it ended its days, often in a scrap-yard in India or China. Most had a quite ordinary and mundane existence but several had exciting lives. There was the Glen line ship captured in the war by the Germans and used as a U-boat supply ship. Recaptured, she was used by the Ministry of War Transport and finally reverted to the Merchant Navy. It is surprising how many were later laid up or sunk following an on-board fire, notably one in which the cargo of butter caught fire during the night thirty-five miles off Montevideo and sank with the loss of the entire crew. As well as providing information on the ships, in many cases information is given about the owners, with a brief history of the major lines to be found in the London docks. The future direction of international cargo shipping is indicated in the book’s final photograph: an early container ship moored in Tilbury Docks. It was the start of a shipping revolution that would make all the vessels on the previous pages redundant within just a few years.